Bitcoin: What Is It and Where Did It Come From? In my opening post, I cited Bitcoin's skyrocketing price as a distraction from blockchain's potential to be the most revolutionary innovation since the creation of the internet. In addition to distracting from blockchain's promise, I think that the price of bitcoin the currency serves as a distraction from just how revolutionary Bitcoin the technology truly is. While the mainstream media debates endlessly on whether or not bitcoin merits its $12,000 price tag, they don't seem to spend much time covering just how incredible it is that a $200 billion dollar global financial network without any formal government or corporate structure cropped up out of nowhere. Where Bitcoin came from and how it works is a fascinating story which I'll attempt to cover here. In 2008, some anonymous person (or group) using the name Satoshi Nakamoto published an 8 page paper to an internet forum that laid out the framework for an internet currency that operated outside of banks and governments. To keep the currency secure, Nakamoto came up with a clever system that would incentivize people all over the world to run software that would secure the network by maintaining a shared record of transactions (blockchain). This software was open sourced which means that anyone in the world could contribute to it and help make it better. In the years since it was unleashed on the internet, thousands of people contributed to the code, built businesses and infrastructure around the Bitcoin network and adopted the currency. In that time, the value of one bitcoin went from eight hundredths of a penny to over $12,000; a $200 billion global financial network emerged from the depths of the internet. To this day, Satoshi Nakamoto's identity remains unknown. Bitcoin is a difficult thing to wrap your head around, mainly because nothing like it has ever existed before. Bitcoin (with a capital B) is a global network that facilitates the transfer of the bitcoin (lower case b) currency, relying on a decentralized network of computers rather than trust in centralized institutions. There is no Bitcoin headquarters, where the Bitcoin CEO discusses the 4th Quarter Bitcoin earnings report in a boardroom full of Bitcoin executives. Bitcoin simply exists on the internet, owned by no one and maintained by thousands of passionate people all over the world. The Bitcoin story began on a cryptography message board when the world was in the midst of the 2008 financial crisis, a time when trust in traditional financial institutions was at an all-time low. A mysterious poster using the name Satoshi Nakamoto posted a paper entitled Bitcoin: A Peer-to-Peer Electronic Cash System. It laid out the framework for "a purely peer-to-peer version of electronic cash" that would replace the need for trust in banks and governments with reliance on computer code, algorithms and cryptography. So what was so special about Nakamoto's proposal? It was not the first digital currency ever attempted - it had several predecessors that all failed, mainly because they were unable to solve what's referred to as, the "double spend problem", without appointing some kind of trusted 3rd party to make sure no one was cheating the system. If a 3rd party is needed to verify transactions, it starts to look like a bank, which is precisely what Bitcoin aimed to avoid. In the physical world, exchange is simple: if I hand someone a dollar, they have it and I no longer do. In the digital world, if I send someone a file, I'm not sending the original - I'm sending a copy: I retain the original and the person I sent it to has a copy. That scenario applied to a currency would be disastrous, and is referred to as, "the double spend problem". So how could Nakomoto get someone to trust that the bitcoin they're receiving online wasn't a copy that had already been spent elsewhere without having a bank or trusted third party like PayPal verify it? Having all transactions be processed through a central authority was counter to what Bitcoin aimed to accomplish, because it would concentrate power in one place. What Bitcoin needed was a way of validating transactions without a central authority. In my opening post, I established that a blockchain is simply a ledger of transactions distributed across a network of computers. That ledger is made up of blocks that chronologically list every transaction that has ever occurred. These blocks are linked through cryptography which means that once a new block is added, it is permanent and can't be altered. Miners are the ones that collectively update the blockchain by agreeing on which blocks of transactions to add to the blockchain through what's called a "consensus algorithm." When new bitcoin transactions occur, they are broadcast to every miner in the network, upon which each miner collects those transactions into a block. Only one miner wins the privilege of adding their block to the blockchain, collecting newly created bitcoin and transaction fees in the process. To win that privilege, they have to do what's called proof-of-work. Warning: here's where things start to get weird, so bear with me. To complete proof-of-work and win the privilege of adding the next block, miners use their computers in a competition to solve a complex and time consuming math problem. When a miner solves the problem, they announce it to the network, along with the next block of transactions. At this point, the rest of the miners verify that the transactions in the block are valid by checking them against the history of the blockchain. If 51% of the miners agree on the transactions contained in the block, a signal is sent to the network to update itself and the transactions become irreversible. At this point, the process starts all over again. This weird mathematical competition is what makes the bitcoin network secure. Miners have to solve this computationally difficult math problem because it ensures that it takes actual real world resources to add transactions to the blockchain - solving the problem requires computing power, which requires electricity, which costs money. As I stated above, 51% of the miners need to agree on the transactions within a block before they become irreversible. This means that if any bad actor acquired 51% of Bitcoin's mining power, they could theoretically add false transactions to the blockchain. Since the global bitcoin network has 100x the computing power of Google, this would be incredibly cost prohibitive to do. With the energy it costs to complete proof-of-work, it would cost billions of dollars to acquire 51% of the mining power and double spend just one bitcoin; at that price, you would be better off putting those resources into earning bitcoin the honest way just like the rest of the miners. Why Is It Called Mining? The term mining conjures up images of dirty men in overalls with pick axes and hard hats pulling gold from the ground. While bitcoin mining involves none of those things, there are some similarities to gold mining from which the name is derived. Gold is a scarce resource and extracting it from the earth costs money in the form of equipment and labor. Bitcoin is also a scare resource that costs money to acquire in the form of the mining equipment and electrical output described above - only when those resources are spent to win the block reward are new bitcoins created. Bitcoins are a scarce resource because Nakamoto's protocol dictates that there will only be 21 million bitcoins ever created. Originally, the miner reward for adding a block was 50 bitcoin, before it was halved to 25 and then halved again to the current reward of 12.5 bitcoins per block. It will continue to halve at regular intervals until the year 2140, when no more new bitcoins will be introduced into circulation and miners will be paid solely in transaction fees. So that's the meat and potatoes of how bitcoin works: miners run software that enters them into this complicated mathematical competition to determine which miner gets to add the next block to the blockchain. When a miner wins, pending transactions on the bitcoin network are added to the blockchain and become irreversible. 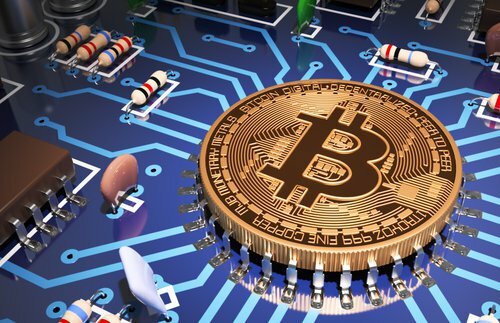 The miner receives newly issued bitcoin as well as transaction fees, which was their incentive to run the Bitcoin mining software in the first place. Still confused? Join the club: mining is a confusing process. The most important take away is that mining is how a decentralized currency functions and remains secure. If John gives me a check for $100 USD, I deposit it to my bank and trust that the banks will tally that I have $100 more and John has $100 less. If John pays me 1 bitcoin, mining is the process that the bitcoin network uses to securely record that I have 1 more bitcoin and John has 1 less, while insuring that John actually had the 1 bitcoin to pay me to begin with. When learning about Bitcoin and blockchain technology, decentralization is a concept that you will see often. Bitcoin's decentralized nature allows it to operate globally, without being shut down by any government or environmental disaster and without being controlled by any single powerful entity. To illustrate the importance of decentralization, think of Napster versus a peer-to-peer file sharing service like Gnutella. When the United States decided that Napster was illegal, they went to the Napster headquarters and demanded they shut down their servers - Napster was dead. Meanwhile, P2P file sharing services like Gnutella that allow people to share music for free exist to this day because there is nothing to shut down. The network exists across thousands of users that have downloaded the Gnutella software. Bitcoin has no central point of failure which means that if the Chinese government, for example, wanted to try and shut down Bitcoin by making mining illegal, the network would be unaffected because the rest of the miners around the world would continue operations as normal. To shut down Bitcoin would mean you would have to shut down the internet - not going to happen. So how did Bitcoin go from being worth eight-one hundredths of a penny to over $12,000 per bitcoin? For the first two years, it was basically unknown outside of the developing community of programmers that wanted to see the project succeed. The first ever bitcoin transaction occurred when one Bitcoin user agreed to sell another two Papa John's pizzas in exchange for 10,000 bitcoin. There's a twitter account that tracks the present day price of those pizzas- worth over $120M in today's dollars at the time of this writing. Bitcoin first came into public awareness with the creation of The Silk Road: a decentralized marketplace that launched in 2011 where any product could be bought or sold (including illegal drugs). Bitcoin was this internet marketplace's currency of choice and the price shot up to around $10 based on demand. When Gawker ran a piece on Bitcoin's role within The Silk Road, the price jumped up to $30. In 2013, the tiny Mediterranean nation of Cyprus fell into financial crisis and started dipping into their own citizens' bank accounts to bail themselves out. This painted a clear use case for a currency that existed outside the control of governments and the price shot up again to $230. Then the Chinese markets started pouring Chinese Yuan into bitcoin, seeing an opportunity to get their money out of an economy they feared was in danger of collapsing; bitcoin surged to over $1,200. Then from 2014 to 2015, the music stopped and a series of events brought bitcoin back to earth. China, fearing that Yuan would continue to pour into bitcoin, ruled that it was "not a currency in any true sense of the word" and tightened controls. The FBI arrested the founder of The Silk Road and the most popular exchange for buying bitcoin (Mt. Gox) collapsed due to mismanagement. These 3 events caused panic in the markets and sank bitcoin to a low of $200, but the network rolled on. In 2016, bitcoin showed its resilience, recovering to just under $1,000 at the end of the year. In 2017, bitcoin went parabolic on global interest, surging to its current high of $12,000. In addition to mainstream global awareness, the price surge is due to more and more people and institutions viewing bitcoin as a legitimate asset rather than a scary magic internet currency. Two of those institutions are The Chicago Mercantile Exchange and The Chicago Board Options Exchange, which will be launching bitcoin futures markets this month - a sign that Wall Street and the mainstream financial world is taking Bitcoin seriously, in a big way. So what could possibly justify bitcoin's value? All a bitcoin is is a string of 1's and 0's on a digital ledger, so how could something that has no physical representation be worth over $12,000? First off, anything can have value if people agree it has value. Throughout history, that has included anything from cows, to seashells, to rare metals, to paper currencies backed by governments. In today's digital world, people have agreed that something that is purely digital has value - the price of that value is, and will always be, determined by free markets. Scarcity: The Bitcoin protocol dictates that there will only be 21 million bitcoins ever created; unlike fiat currencies, where governments cause inflation by continually printing new currency, bitcoin is deflationary. Bitcoin is similar to gold in that it derives value from being scarce. Increased demand for a scarce asset drives up its price. Medium of Exchange- anyone with an internet connection can transact with anyone, anywhere in the world. If I wanted to send $10,000 to someone in another country, the quickest way to do it with fiat currency is to take it on a plane and bring it to them in cash. With bitcoin, it can be done in minutes. Store of Value- Due to its scarcity and the security of the bitcoin network, bitcoin is similar to gold in that it is a place to store your money outside of government issued currency. While gold has a couple of hundred years head start on bitcoin, with each passing day bitcoin's reputation as an effective store of value grows more and more true - ask Paypal founder Peter Theil . Community: Just like Facebook is valuable because billions of people use it, the growing bitcoin community of developers, miners, businesses and people who transact in bitcoin give it tremendous value. In 2016, $100,000 worth of bitcoin was transacted every minute and 2017 saw bitcoin's user base grow to over 19 million. With more and more users entering the network each day and with 2.5 billion people in the world who don't have access to traditional financial services but do have access to the internet, the potential for the Bitcoin network to grow is tremendous. Speculation: There's no question that speculation plays a huge part in bitcoin's current valuation. Speculation that this scarce asset's utility and community will grow in time has driven the price well beyond it's present day utility value. If Bitcoin adoption fails to live up to expectations, bitcoin's value will surely fall. Bitcoin is, and will continue to be for the foreseeable future, subject to wild swings brought on by the speculation of the crowd . However, regardless of speculation, Bitcoin is valuable because there is utility in a borderless, non-government issued currency that can move at the speed of the internet. If you live in America, you might not see the need for it in your everyday life because the dollar is stable and we have cool things like Venmo and Applepay that make transacting seem effortless. If you live in Venezuela or Zimbabwe, where you need 8 duffle bags full of your hyper-inflated currency just to buy a sandwich, you might be more inclined to agree. That's not to say that bitcoin is perfect, or anywhere close to it. For one, its mining process has raised environmental concerns over the amount of electricity miners burn to maintain the network. Secondly, the network is currently prone to congestion which raises transaction fees, making it too expensive to use for small purchases. Thirdly, people are more likely to hoard it than use it as a currency as originally intended due to expectations that its price will continue to rise. Fourthly, the network can't handle anywhere near the capacity that something like Visa or Mastercard can, so much innovation is needed if it's going to reach mass adoption. Lastly, bitcoin is still figuring out what it will ultimately become: a global internet currency, digital gold, or both - a subject that is hotly debated within the Bitcoin community. Whether you think bitcoin is the future of money or a speculative craze bound to collapse, I think one thing is beyond debate: Bitcoin is an absolute marvel of modern technology and human collaboration and a testament to the crazy times in which we live. A completely anonymous person (or group) posts a paper and some code to the internet and the end result is a $200B global network that is challenging the way we think about trust and money. If that weren't enough, it gave the world the blueprint for blockchain technology that is likely to change the way we transact forever. If you found this to be informative, hit the like button down below and share this post on social media. To stay up to date on all things blockchain and cryptocurrencies, subscribe to my website. Send any feedback to connor@cryptoambit.com. Next: Ethereum - What is it?